Your dog will look festive for those special holiday photos! 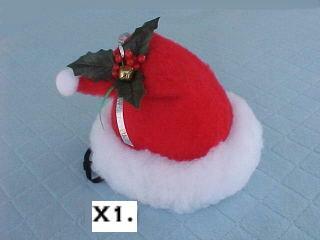 Made of soft red and white fur accented with holly and gold bell. Your dog will be warm and festive with this cute coat. Looks great with Santa Hat for those special photos! Made of soft red and white fur. It has a genuine leather belt that buckles. It looks great with Santa Hat. X4. 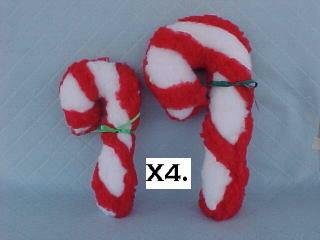 Fleece Candy Cane Chew Toy. Your dog will love this for Christmas! X5. 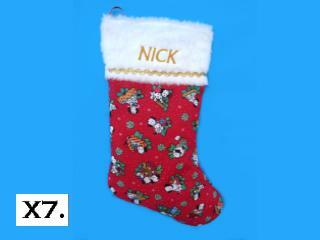 Dog Breed Stocking. 16" tall. 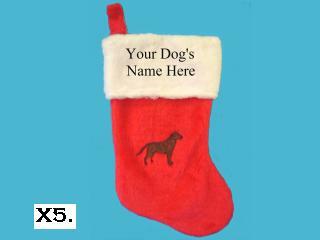 Christmas stocking with your dog's breed and name. Made of soft red and white fleece accented with gold trim. X6. Bows & Bones Christmas Stocking. 16" tall. 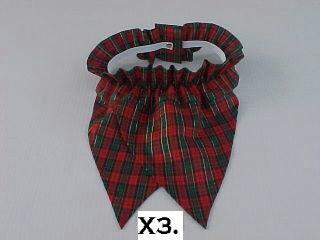 Embroidered with metalic green bows on shiny silver bones. Customize with your dog's name embroidered in gold. X7. 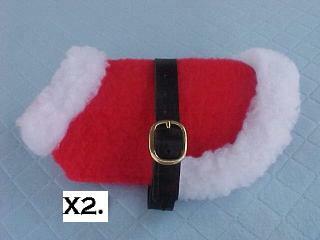 Christmas Puppies Stocking. 15" tall. 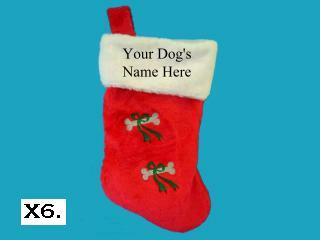 Christmas stocking with your dog's name. Accented with shiny gold trim. X9. Sleigh Bells. 12" long. 4 silver sleigh bells mounted on a 1" wide burgundy strap. can ring them when it needs to go outside. These soft, cute, stuffed toys will delight any dog. 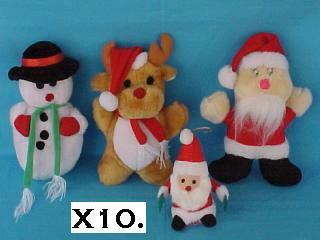 Snowman and Reindeer are 7" tall. M25. 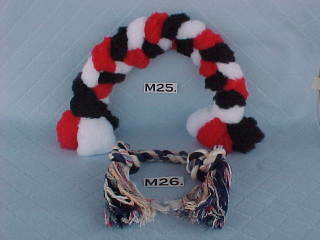 Large 18" Braided Fleece Chew Toy. X11. 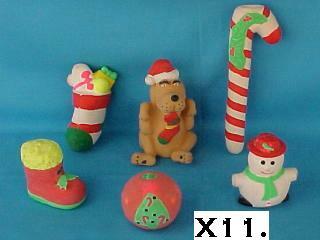 Soft Latex Christmas Toys. 6 Cute Christmas Toys to choose from. Gingerbread Man, Lantern, Christmas Mouse.